Frequently asked questions about rainbow trout management in Minnesota's Portion of Lake Superior. Lake Superior Area has continued its annual spring and summer creel surveys. The spring creel targets anglers fishing rivers and near river mouths on 17 Lake Superior tributaries and has recently added McQuade Harbor, whereas the summer creel focuses on those angling primarily by boat on Lake Superior. Annual completion reports for both creel surveys are available on the Lake Superior web page. Duluth Area staff annually conducts a fall aerial survey of beaver activity within the Knife River watershed. When required, beaver trapping and dam removal is contracted with the US Department of Agriculture. The Blackhoof River is also assessed for beaver activity by canoe. The 2011 and 2012 flights were conducted on October 27th and October 31st, respectively. "This document is an annual report on activities related to the management of rainbow trout in the Minnesota waters of Lake Superior and its tributaries." 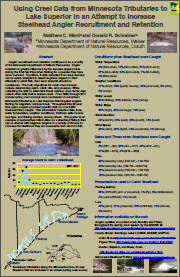 Rainbow Trout management summary for Minnesota waters of Lake Superior 2010 "This document is an annual report on activities related to the management of rainbow trout in the Minnesota waters of Lake Superior and its tributaries." In the fall of 2011, 11 beaver and 7 dams were removed from the anadromous portion of the Blackhoof River. Ten beaver and 8 dams were removed in 2012. A total of 32 beaver and 42 dams were removed from the main tributaries of the Knife River after completion of the 2011 flight. 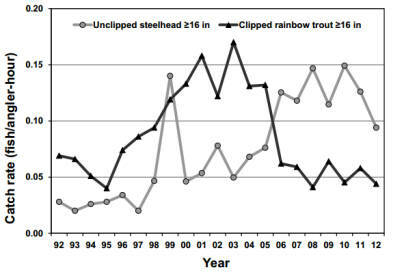 An evaluation of stocking location for hatchery-reared clipped steelhead yearlings in the Knife River has concluded. The primary objective of the study was to determine if stocking the upstream reaches rather than near the river mouth would increase the imprinting and/or survival rate prior to smoltification, which would decrease straying and increase the number of adults returning to the Knife River. 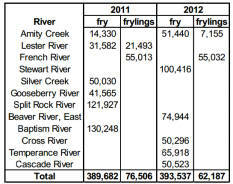 Approximately 20,000 hatchery yearlings were stocked upstream of the trap in the mid-section of the Knife River watershed and 20,000 were stocked directly downstream of the trap from 2003-06. Thirty-seven percent of juveniles stocked upstream of the trap were implanted with coded wire tags (CWTs) while those stocked downstream of the trap were not. Overall, 17.5% of all juveniles stocked were implanted with CWTs. Of the 760 maxillary-clipped adults sampled from 2005-2011, 11.7% possessed CWTs, a significantly lower percentage than that of yearlings stocked with CWTs. The adult return rate for yearlings stocked near the mouth was 0.6%, compared to 0.1% for those stocked in upstream reaches. Lower return rates and potential competition with naturally reproduced smolts are reasons stocking yearlings in the upstream reaches of the Knife River is not recommended. Further details are found in Ward et. al (2012). 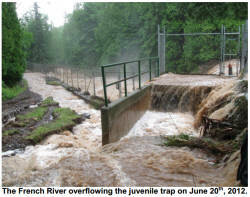 The June 2012 flood caused major damage to the both the French and Knife River traps. The French River juvenile and adult traps sustained damage to grates and screens and both required considerable debris removal, but both have been repaired and are ready for spring activities. The reservoir upstream of the juvenile trap completely filled with sediment and had to be cleaned out to maintain the water source for spring spawning operations at the French River Area Office. Damage to the Knife River trap was so extensive that the trap was not operational in the fall of 2012 and will not be operational in the spring of 2013. Official estimates have not been acquired, but repair would likely cost $200,000-$300,000. The final decision to repair or completely remove the trap has not been made yet. Archival Tags, Stable Isotope Analysis, and Bioenergetics Modeling The archival tagging study which began in spring 2006 was completed in March 2012. The purpose of this study was to determine the habitat used by Kamloops and steelhead in Lake Superior, to reveal similarities or differences between their habitat use, and to help anglers pursue these fish. Upstream Posted Boundaries and Fish Sanctuaries on North Shore Streams Tributary of Lake Superior. Streams not listed have no upstream boundary and are subject to below-boundary regulations throughout their length.